Women in Science and Mathematics at Monmouth University (WiSM@MU) is a professional and social support and networking group for female faculty and staff in the School of Science. At present our activities include purely social functions (brown bag lunches), fund-raising for women in science, celebrations of women in science (Ada Lovelace Day celebration), and organization of lectures about women in science or by women in mathematics. 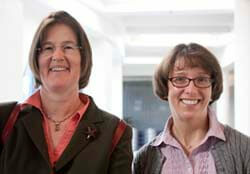 Associate Dean Catherine Duckett and Dr. Robin Kucharczyk are the primary contacts for WiSM@MU. If you would like to be involved, suggest an activity, or just ask a question, please contact either of them. Our mission statement is also available.